Alaska Aces’ Jeron Teng hangs on as Bolt Trevis Jackson reaches for the ball in a one-on-one in their PBA Philippine Cup skirmish yesterday at the Big Dome. MANILA, Philippines — Jvee Casio and Kevin Racal finally returned from a long layoff and provided significant help as Alaska Milk snapped out of a three-game slump, pulling off a crucial 92-77 triumph over Meralco in the PBA Philippine Cup at the Smart Araneta Coliseum last night. With boost from Casio and Racal, the Aces played a solid game throughout and caught up with the NLEX Road Warriors at sixth place at 4-5. “A bunch of guys did better for us tonight. It’s nice to have Jvee and Kevin back. They’re still a little bit rusty and out of shape but they came in and made some plays in a way they usually do,” said Alaska coach Alex Compton. “And to be honest, it’s a huge win for us. I’m happy to get that win. Kung natalo kami, baka Boracay kami,” Compton also said. Moving on the brink of elimination were the Bolts with their seventh loss against three wins. While the Aces saw the return of two key guys, the Bolts saw the exit of two major players. Ranidel de Ocampo and Jared Dillinger have been declared out for the rest of the all-Filipino tourney both on account of an injury. 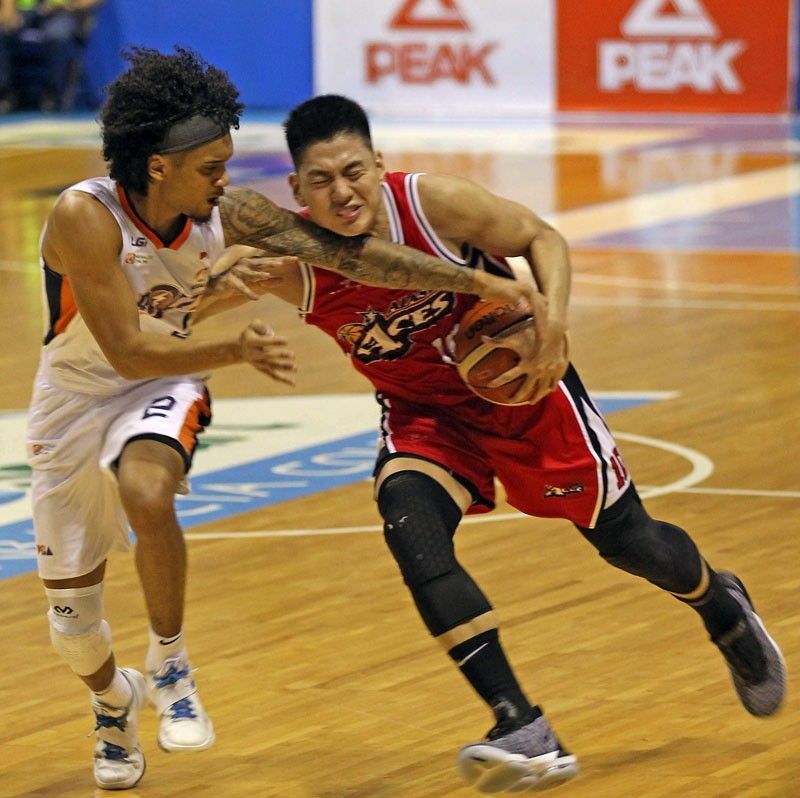 With more firepower and their usual defensive effort, the Aces dominated the Bolts, leading by as many as 18, 92-74, towards the end. “We played well defensively as a team. I’m happy about limiting them to 77 points. It’s not been an easy conference for us, but our guys responded well tonight,” said Compton. Later in the night, Magnolia made it a three-way logjam at sixth place with NLEX and Alaska on a rollercoaster ride ending in a drubbing of NorthPort, 103-90. In making the necessary adjustments in the second half, the Hotshots added to the woes of the Batang Pier who reeled with a sixth straight loss after a 2-0 start in the tourney. Alaska 92 – Teng 16, Enciso 14, Banchero 13, Thoss 13, Casio 12, Racal 9, Cruz 7, Pascual 6, Baclao 2, Exciminiano 0, Ayaay 0. Meralco 77 – Salva 23, Canaleta 18, Newsome 11, Amer 8, Quinto 5, Tolomia 4, Hodge 3, Hugnatan 2, Pinto 2, Jackson 1, Caram 0, Faundo 0. Magnolia 103 – Lee 24, Sangalang 20, Brondial 14, Jalalon 11, Barroca 11, Melton 11, Dela Rosa 5, Reavis 5, Herndon 2, Pascual 0. Northport 90 – Anthony 22, Tautuaa 19, Pringle 15, Grey 14, Lanete 8, Guinto 4, Elorde 3, Bolick 3, Taha 2, Gabayni 0, Sollano 0.